As a student and practitioner of too much sitting, I am always looking for new insights on this modern problem. I wanted to find a new perspective on this sitting problem that I had not yet encountered. So, I enlisted the help of my sister-in-law, who is a practicing occupational therapist in a public school system. Nick: Hi Stephanie, can you tell the StandUpKids audience who you are and what you do? Stephanie: Sure thing! My name is Stephanie Borem and I am an occupational therapist (OT) assigned to the Brownsburg Public School System in Brownsburg, Indiana. I work in schools in grades Kindergarten – 5th grade in general education, and life skills classrooms. I also am assigned to one middle school and our one high school, Brownsburg High School. N: What are you main tasks related OT in the schools? S: The main areas I address are working with students with their handwriting, how they are positioned and seated, as well as providing other sensory supports. N: What is about sitting that concerns you most as an OT? S: A big problem I see is that desks do not fit individual students. I commonly see one table with 6 kids around it. Each student is a different size, so a fixed height table does not work for each learner. There are so many ways you can sit, so it becomes too easy for students to sit in a bad position. N: How have you seen the effects of sitting impact learning in the schools? S: Across the board, kids do not have enough recess time. Kids are sitting more at home which is reinforced by having a sedentary lifestyle while in the classroom. I think kids have better posture when standing, their shoulders are more stable, which helps with handwriting. Standing helps students have better core stability. It all starts with the core. N: You recently applied for a local grant to get more standing desks in your school system. Can you disclose any details? S: Yes! And, I am happy to report that my grant application was selected! I received $1372 to buy standing desks. With the model of standing desk I ordered, I was able to order 6 standing desks. It is a small start, but I am very fortunate that this school district has the Brownsburg Education Foundation to offer this funding to our students. N: After the desks are placed in each classroom, how are you going to use them on a day-to-day basis? S: I have a team of therapists that I lead, so I will work with them along with resource teachers to determine how much of an impact the desks are making. N: When you receive the desks, how will you determine which students will get a desk? S: This is something I am still working on. I have the support of many school principals, so it’s now a matter of logistics: identifying which students could benefit the most, talking with teachers and parents, and putting the desks together themselves. N: Is there any way to track how valuable these desks are to students, teachers, or the school? S: Yes, great question, I think that will be very important. Teachers are often concerned with class disruptions and keeping a student’s attention focused on the lesson plan. Standing desks are often said to increase our attention while working, but it would be nice to have same (real world) data behind then. We could track things like grades, office referrals, and various needs for accommodations. Having some sort of pre- and post- measure would be ideal. N: With my background in behavioral science and consulting with organizations, I would be happy to help out where I can. This could be a neat pilot project to show the school system how we can build the case to buy more desks. Having the best measures in place to determine a student’s progress in the classroom and towards certain health goals is essential. S: Definitely! I will keep that in mind as I navigate this first round of standing desks. N: Great! Are you worried about any kid being stigmatized about having a standing desk because there are only a handful available for the entire school system? S: No, not at all. Alternative seating is common. Students sit on balls, have cushions, and use movable chairs in many of our classrooms. N: The impact of the social environment is always an important consideration. 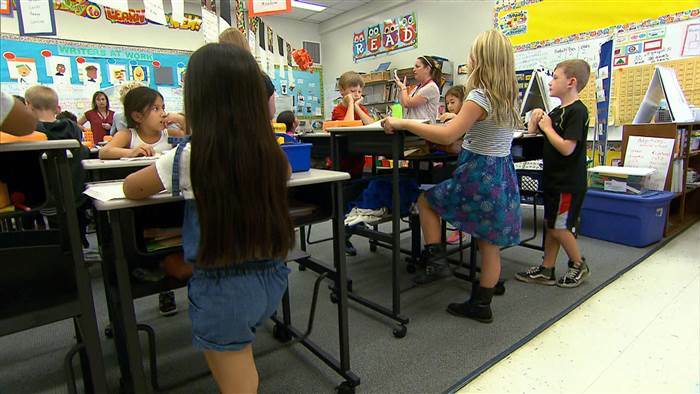 What has been the teacher response to having standing desks in the classroom? S: It is still early, but teachers have been supportive of alternative seating in years past. For example, we ordered stability balls and they were requested for almost immediately after they came in. But yes, support from staff at all levels in the school system is very important for standing desks to become the new norm in school. N: Stephanie, thank you so much for your insight on this important issue! Do you have any parting words to share with the StandUpKids audience? S: We have to have more activity throughout the day. It is my goal to get more desks in the school system that I work in right now. I would like to see standing desks become a part of individual education plan for all students. That way, we can meet students’ physical activity needs. It was a pleasure to talk with Stephanie about this important issue our children are facing in school. She offered a unique perspective and I learned quite a bit from our brief Sunday conversation. Every little bit of information helps. If you have any questions for myself ([email protected]), Stephanie ([email protected]), or StandUpKids, please let us know.